Alternate Title: What I would have registered for if I’d have known we’d move a zillion times in the first 5 years of marriage! In the past 7 years, we have moved a lot and rented a lot. While those beautifully organized rainbow pantries on pinterest are fun to look at, our reality is small rental houses with old kitchens and no pantry. And maybe yours is too!? I’ve grown to enjoy coming up with cheap or free organizing systems for whatever house we’re in. After 4 moves, 4 cities, 3 states, and 3 kids, we’ve adopted a somewhat “minimalist” mentality when it comes to stuff. Meaning, if we don’t use it regularly, we don’t keep it. 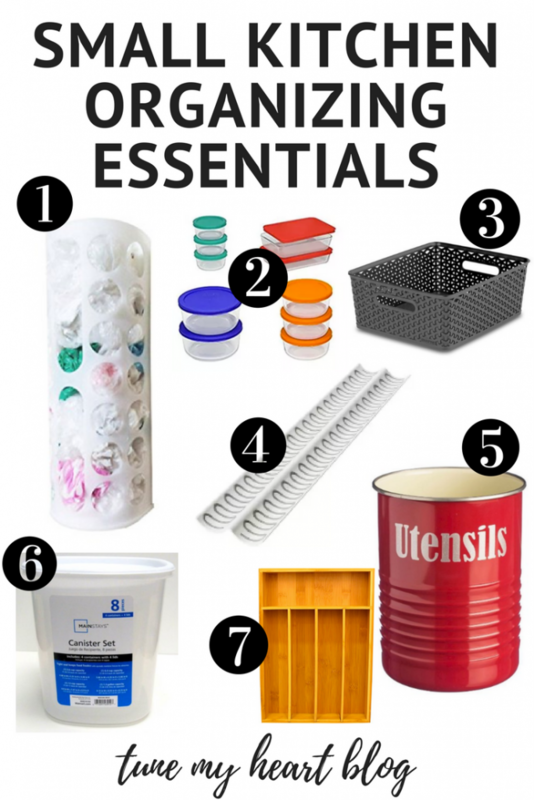 This post is a complete guide to kitchen essentials and cheap organizing solutions that can work for you no matter what kind of space you have. 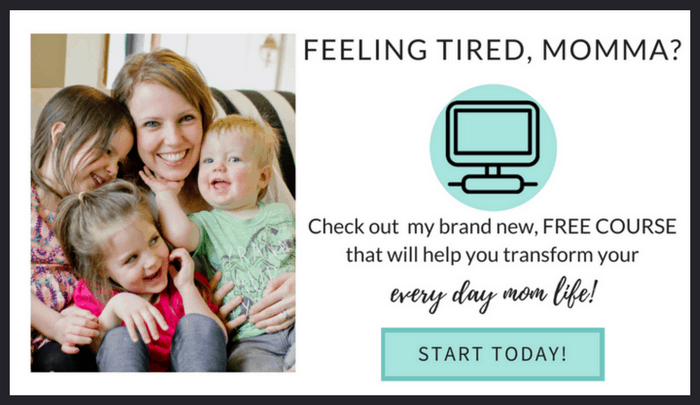 *NOTE: the prices are approximate for the day this post was published 3/8/2017, so they might vary. 1. ANOLON NON STICK 8.5 INCH SKILLET ($21) – I use this every single day to make eggs. I hand wash it, and after 3 years, it still looks brand new. It’s held up way better than our original Calphalon one. 2. ALL-CLAD STAINLESS STEEL 12″ FRY PAN WITH LID ($107) – We had a set of Calphalon non-stick cookware when we first got married, and I so wish we would have gotten stainless steel. 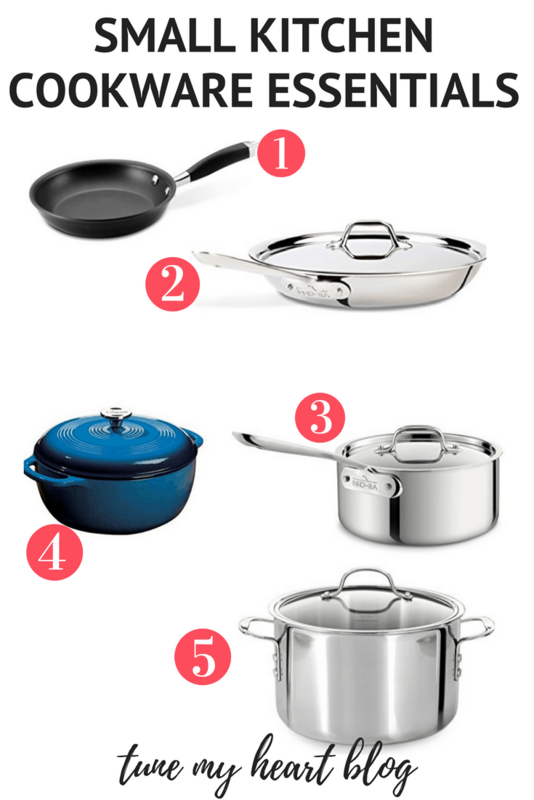 I’m slowly swapping out higher end stainless steel pots and pans and they are amazing. I LOVE using this 12″ fry pan for one-skillet dishes. 3. ALL-CLAD STAINLESS STEEL 3 QUART SAUCE PAN WITH LID ($107) – 3 quart is the perfect size. Small enough that you can do a roux, big enough to make 2 boxes of mac and cheese for your tinies. I often see these at Home Goods for a discounted price! 4. LODGE 6 QUART DUTCH OVEN ($60) – I don’t own this, but it’s on my wish list. After reading countless reviews, Lodge dutch ovens came up as the second best to Le Creuset, which are 2-3x the price. They have a bunch of colors too! 5. CALPHALON 8 QUART STAINLESS STEEL STOCKPOT ($99) – While I’ve generally preferred my All-Clad cookware to Calphalon, I just couldn’t justify the price for this pot. The All-Clad 8 Qt. pot is $237, and it’s not technically on my “essentials” list. You really only need such a large stockpot if you frequently cook soups or sauces for large groups. If you don’t frequently cook in large quantities, I would go with a 6 quart size instead like this one. Honestly I think those are the only 5 pots and pans you need, though you may want 2 of your favorite size if you frequently cook for large groups. 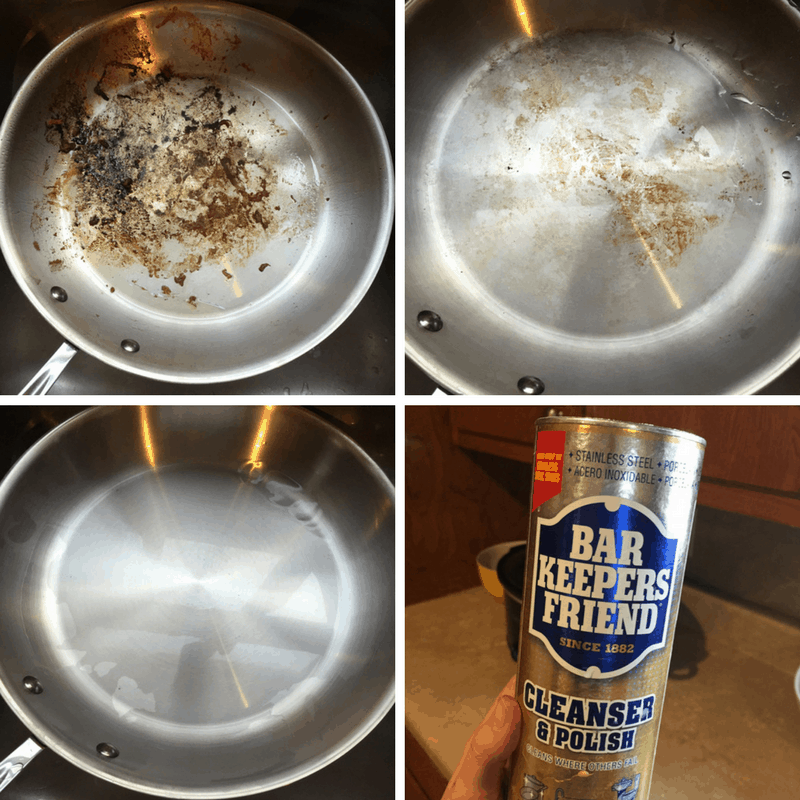 Oh, and as far as cleaning your stainless steel cookware goes, use Bar Keeper’s Friend. It’s under $2 and it is AMAZING! 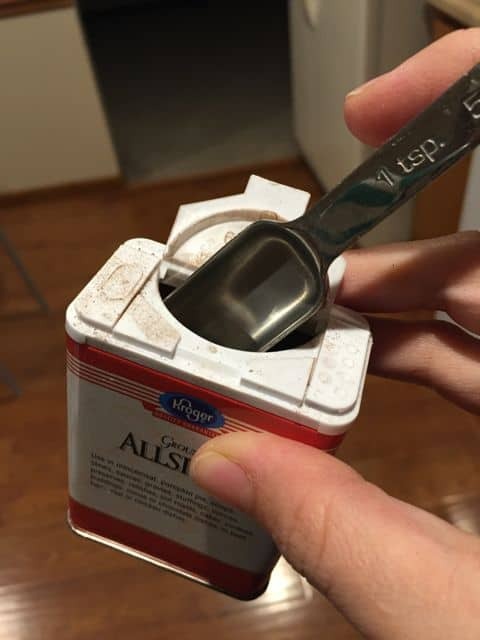 It will get ANYTHING off. I washed it twice with BKF to get the before & after results below. They don’t get anything stuck on them. You don’t need paper liners. They go in the dishwasher. They are a great toy! My kids love playing with these. 2. COLLAPSABLE COOLING RACKS ($12.33) – These are self explanatory right? They fold up for storage, and they stack for cooling lots of cookies on minimal counter space. I’ve had that exact set for almost 7 years! 3. NARROW STAINLESS STEEL MEASURING SPOONS ($9.97) – These are great because even the tablespoon fits in a small spice jar, whereas round measuring spoons are often too wide to fit through the tops of spice jars. 4. 9″ ROUND CAKE PANS ($9.99) – You only need these if you bake cakes, or plan to bake cakes. Not a cake baker? Skip ’em. 5. LIQUID MEASURING CUPS ($22) – Technically, you could skip these if you are going to own number 7, because those collapsable measuring cups work for liquids or solids. BUT, I like the glass liquid measuring cups for using in the microwave. I steam veggies in them daily, and use them to melt butter or chocolate chips for baking. You’d only need the biggest one (8-cup) and smallest (1-cup), but the set of 4 is cheaper than just buying those 2 individually. Soooo…. yeah. 6. PYREX BAKING DISHES WITH LID ($15.88) – This is a crazy low price for this set. The large one is a 9 x 13 glass pan with lid, perfect for desserts and casseroles. The smaller ones are good for microwavable food storage, half portion baked dishes, splitting a dish so you can freeze half, or baked appetizer dips. 7. COLLAPSABLE MEASURING CUPS ($15) – I don’t have these, but my stainless steel measuring cups are always jamming my old-kitchen shallow drawers. So now I kinda want them! 8. BAKER’S HALF SHEET 16 X 11 ($10) – These double function as jelly roll pans and cookie sheets! Whenever something can serve more than one purpose, that’s a win! 9. 8″ SQUARE GLASS PAN ($18.79) – This is another chapter item, that’s not really a minimalist essential. If you own the pyrex set above, you definitely don’t need this. But, I use mine a lot so I put it on here! I use this square pan for brownies, and smaller portions of a casserole or baked pasta dish. 1. 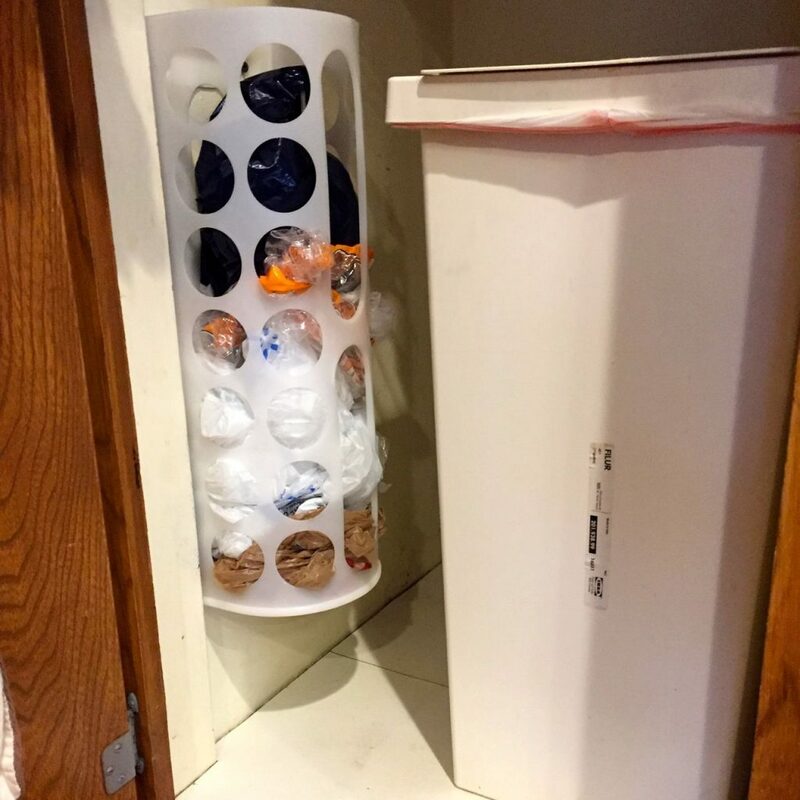 IKEA PLASTIC BAG HOLDER ($1.99) – We used to keep plastic bags in a cardboard box next to the trash can. Because of the way the cabinet and trash can are setup, when you’d go to empty the trash, the trashcan would bang against the box. Or the box would be in the way and bags would overflow. It’s hard to explain, but it was borderline infuriating. I could actually see my husband’s blood pressure rising during this task. Ikea’s $2 bag holder to the rescue! Leave it to Ikea to have a genius idea for plastic bags in a small space. 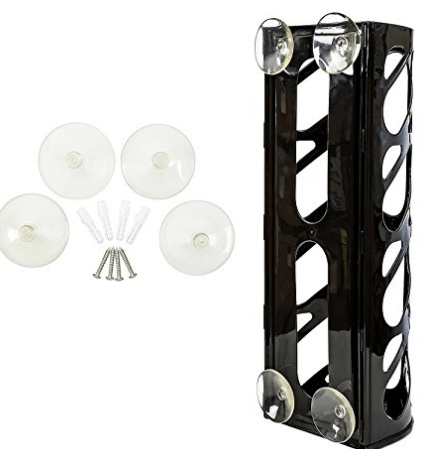 If you don’t live by Ikea, you can buy the Ikea one on Amazon for $10.83 or this other $10 one that looks similar in design, gets good ratings, and comes with suction cups! BONUS IDEA!! 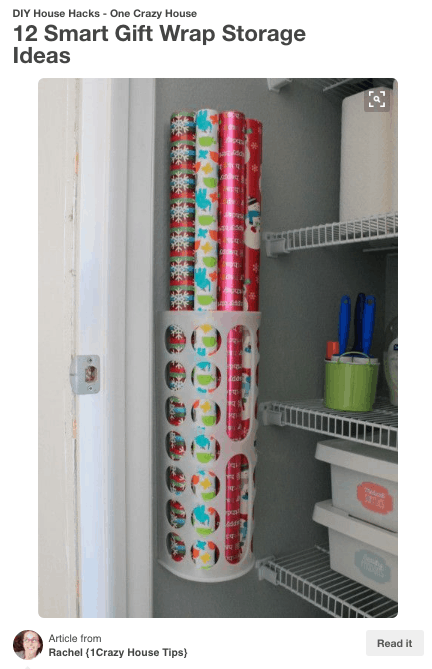 The plastic bag holders easily mount on the wall to corral wrapping paper- for all you wrapping paper hoarders out there. (Fun fact: I never have more than one wrapping paper roll at a time. Is that weird!?) We did this in my mom’s sewing/ craft room closet, and it worked PERFECTLY! They microwave without getting too hot. They’re oven save – the rectangular ones are the perfect size for baking a 2 person casserole type dish or an appetizer dip. They’re very thick, so they don’t break. Well, theoretically, I’m sure you can break one. But speaking from experience of being very clumsy and breaking a lot of glass dishes over the years, these are super sturdy! 3. PLASTIC BASKETS IN CABINETS ($5+) – These cheap plastic baskets at Target are cute and we use them to corral everything in our house! In the kitchen, we use them for plastic kids’ dishes and dish rags. 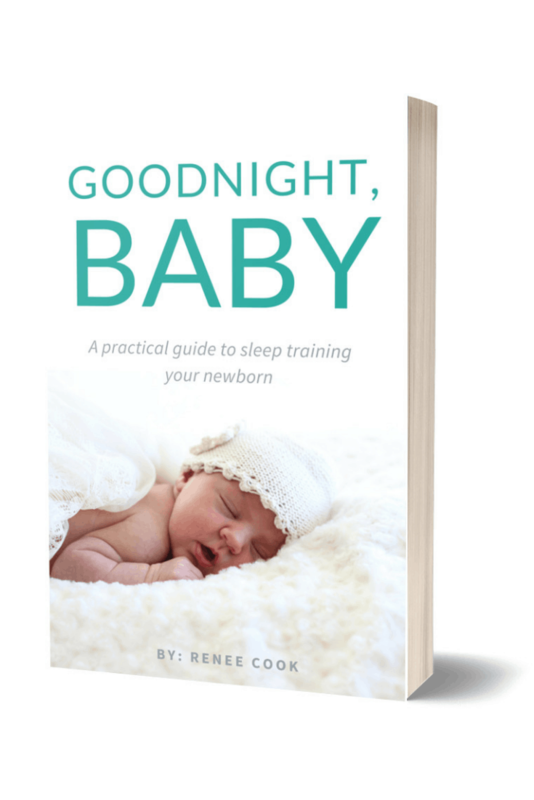 They are durable, cute, and come in lots of colors and sizes. 4. IKEA SPICE DRAWER ORGANIZER ($3.99) – A while ago, I posted a cry of desperation on Facebook- we needed a spice cabinet solution. We had a horrible frequent-avalanche-producing spice cabinet situation and I figured the good people of Facebook could come to the rescue. And you did! The overwhelming consensus was drawers are better than cabinets. 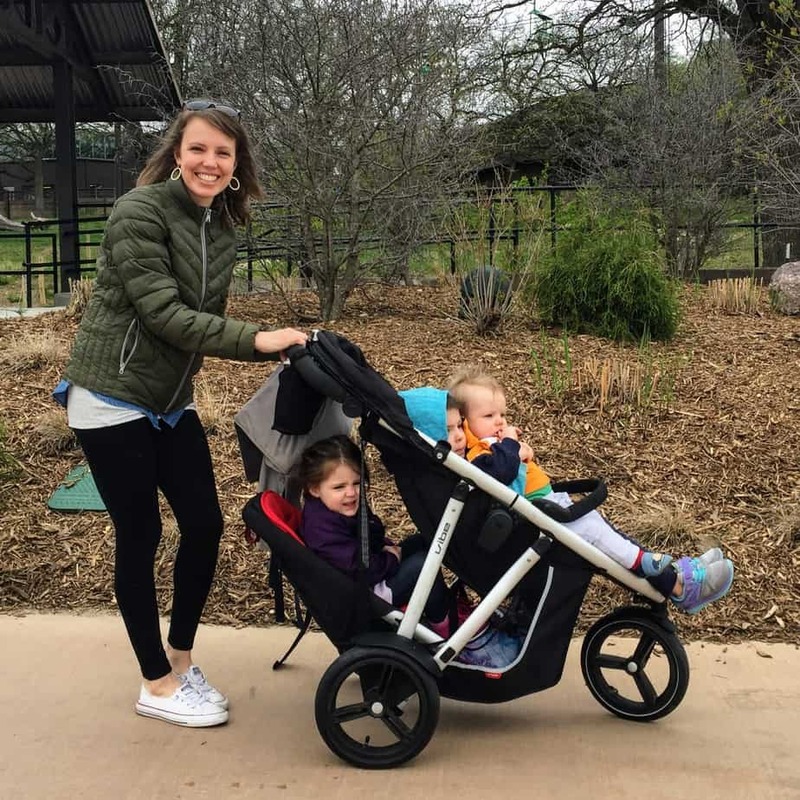 IKEA for the win… again! I have 2 organizers side by side in the picture above. They hold a variety of container sizes – both the tiny McCormick ones and the giant Aldi ones. They have rubber on the bottom so they don’t slide around AT ALL. I didn’t measure our drawers before going to IKEA and my wider kitchen drawers are a half inch too short for the spice racks. I have no idea why or how the kitchen drawers are different lengths inside, but they are. So, not ALL my spices fit in this little drawer. Womp Womp. If I’d measured before hand, I probably would have bought these foam ones from Amazon! Same idea, cheap, highly rated, and you can cut them to size. Only $14.99 for a pack of 6. 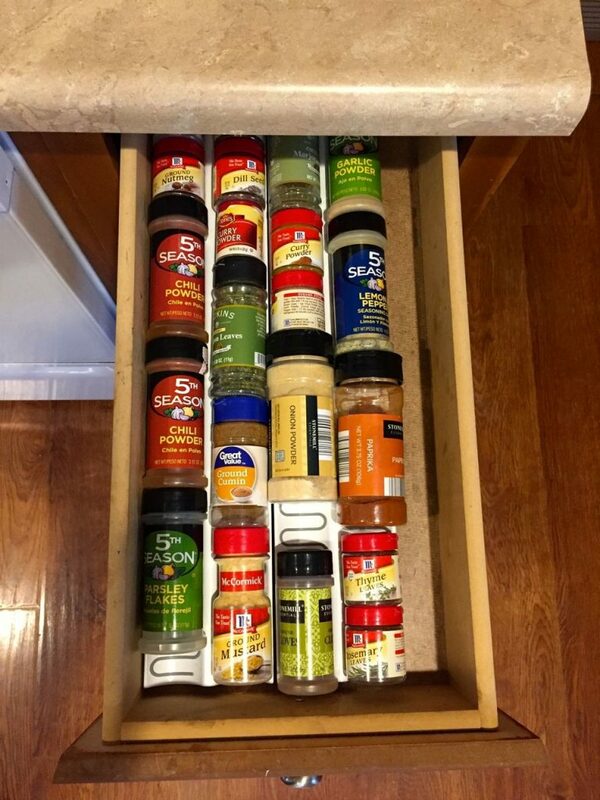 Spices in drawers = revolutionary! You can see all the labels and they don’t move around. 5. GIANT UTENSIL HOLDER ($14.99) – If you are short on drawer space, use a utensil caddy instead of a drawer for your wooden spoons, whisks, etc. 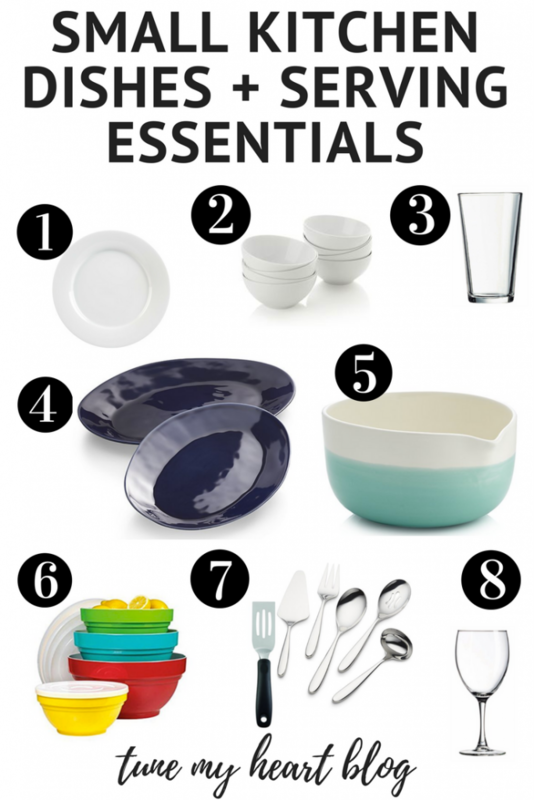 In order to make this work, you’ll have to pair down on utensils until you only have the bare bones essentials. I have 1 each of the following: large spatula, small spatula, medium sized whisk, pasta spoon, tongs, slotted spoon, flipper, and stirring spoon. Look for tools with thin handles and get a big enough canister to hold all of them. I keep serving utensils in a different spot. 6. MAINSTAYS PLASTIC CANISTER SET ($6.88) – I stumbled on these cheap, giant canisters at Walmart several years ago, and never looked back. They’re way cheaper than the fancy Oxo ones. Plus, they are shorter and wider than other large canisters, which work great in old kitchens with short cabinets. They come in a 4 set for $6.88! It’s hard to tell in the product picture, but there are 3 other canisters nesting inside the big one. 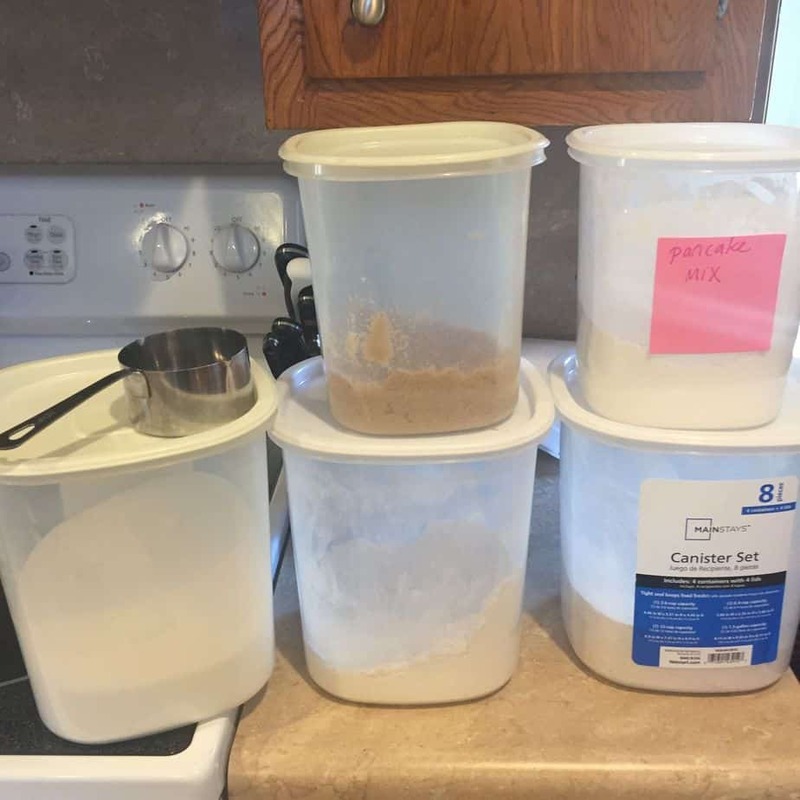 I use the 2 bigger canisters for baking staples and the smaller ones for things like nuts, chocolate chips, home made dressings, etc… I bought 3 sets so that I could have the biggest sizes for white flour, wheat flour, and sugar. A 5-pound bag of flour fits in the big canister, and it’s plenty big for scooping out of! Seriously – get these. They’re the bomb. *The prices and links below correspond with the items pictured above. Most items pictured are from Crate & Barrel, my all-time favorite store for dishes and serving ware. They have a variety of classic and modern options and their stuff holds up very well. We have dropped/ banged our bowls and plates a handful of times and have yet to break one! 1. DINNER PLATES ($36.95/ 8) – I have and love these plain, classic white ones from Crate & Barrel. I shopped around at Ikea, Target, C&B, and Amazon. These “Aspen” ones from C&B were the cheapest high-quality ones. You can buy them individually or in sets of 8. 8 plates is enough for many people. If you frequently have others over for dinner, you might want 16-20. C&B also has a new line of dishes called “farmhouse” that are similar to the Fiesta dishes. Super cute! 2. REGULAR BOWLS ($36.95/8) – These bowls are also the “Aspen” ones from C&B. They’re a great size for soup, salad, cereal, whatever! 3. 12 OZ. GLASS CUPS ($15/10) – We only have one size of glass cups. They came in a set of 12 from Target. If we have more than 12 people over, I buy plastic cups. If you have a small space, don’t own 2 or 3 different sizes of glass cups. Instead, buy as many of a big size as you can store. 4. 1-2 SERVING PLATTERS ($20+) – In my hosting experience, serving bowls get used more than platters. We only had 1 serving platter for a long time. I was recently gifted a second, but we still mostly use serving bowls. World Market and Crate & Barrel have pretty and affordable serve ware. I love dishes and think serving ware is so pretty, so if we ever have a display cabinet or dining room, I’ll probably own more! But if you’re short on space, then you only need 1-2 big platters. 5. 2+ SERVING BOWLS ($20+) – The nice thing about serving bowls is they are very multi-purpose. You can use them for baking, serving, or corralling stuff on counters. I use some of my big serving bowls for produce, then just wash them out for serving if we have company. Giant bowls are a pretty inexpensive way to add pops of color to your kitchen too! 6. MIXING BOWLS WITH LIDS ($20+) – We have the exact ones pictured from Costco. They were $20. I love these!! They’re non-slip, and have lids. Easy for bringing along to someone else’s house. They’re not beautiful, but the fun colors make them work for serving too. The only downside is they’re not microwaveable, but you could buy glass ones with lids instead. 7. UTENSILS ($7+) – I have the small spatula server pictured and love it for any sort of dessert or casserole. I would also recommend one serving fork, one pie server, 1-2 ladles, and 3-4 serving spoons. We use serving spoons way more than serving forks. The ones pictured can be purchased individually here. 8. WINE GLASSES ($1) – All our wine glasses from our wedding registry broke. They were each over $4.00 from Crate & Barrel, but they were so thin that the slightest bump while washing would shatter them. And they weren’t dishwasher safe. My inlaws’ routinely host very large groups, and they bought a TON of wine and water glasses from the dollar stores in our area. They are dishwasher safe, don’t break when they get bumped, and look great on a table setting. Go sturdy and cheap when it comes to wine glasses! 9. NOT PICTURED – Mugs (duh! ), serving trays, cutting board(s) and knives are the other non-pictured essentials that I would say are small-kitchen essentials. If you own 1-2 pretty wooden cutting boards, they can double as serving trays if needed. 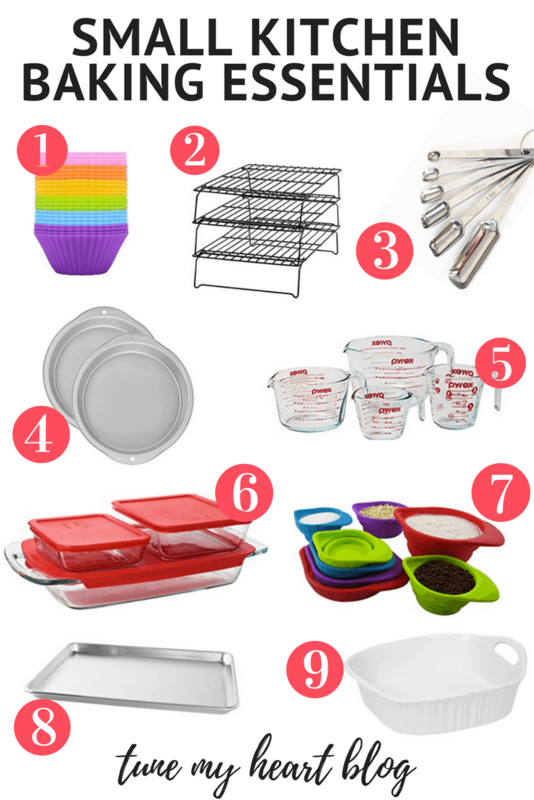 There are a lot of things I purposefully left off this list because it’s specifically geared towards people who have small kitchens and/ or move a lot! What are your favorite kitchen items? What kitchen organizing hacks are you loving lately? Share in the comments below! I like those ideas of yours. I want to get one of those plastic bag organizers to hold Christmas paper. As I tend to toss it out. Otherwise it ends up ruined or forgotten in the shed.